All products include Free Shipping! Taxes will be added for the state of Indiana. 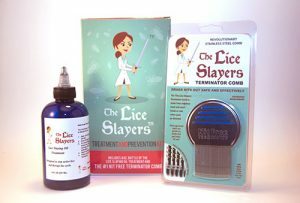 Eliminate lice and their eggs with The Lice Slayers treatment and prevention kit. 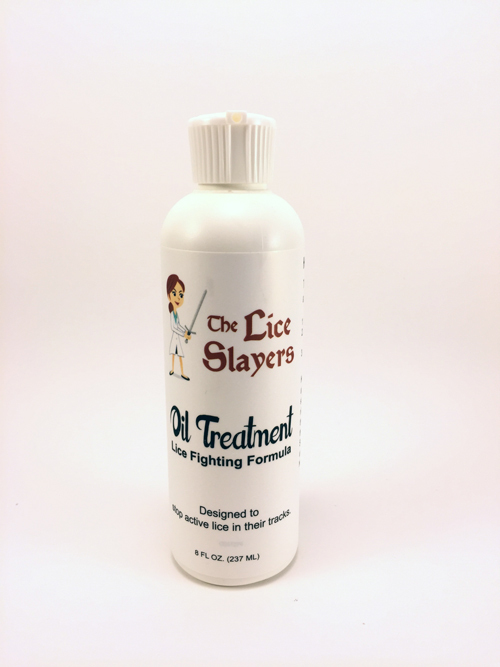 The Lice Slaying oil is pesticide free, non toxic, safe, odorless and non irritating to the skin. Eliminates lice in 10 min. Proven to eliminate 100% of lice and their eggs when used as directed. 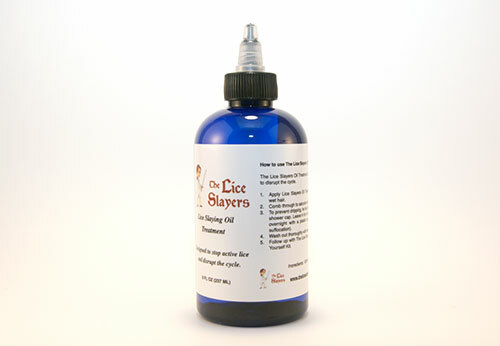 The Lice Slaying oil can also be used as prevention if exposure has been suspected. Includes the # 1 Nit Free Terminator Comb. 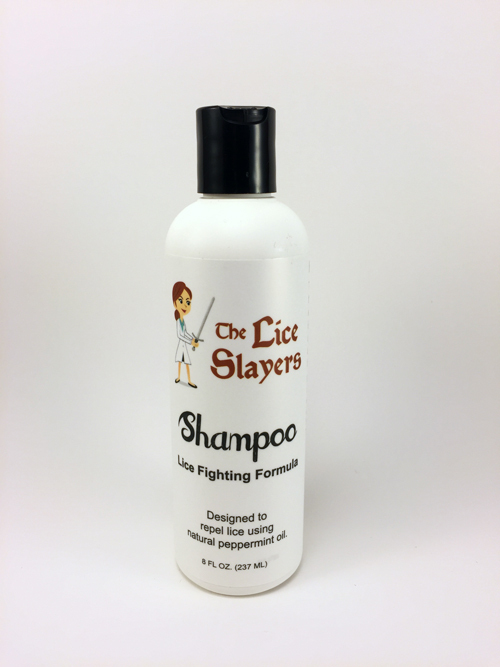 Lice Slayers Shampoo is a natural shampoo and great for home lice treatment. Lice Slayers Shampoo is safe, non-toxic, sulfate free, made with essential oils, fights lice and their eggs (nits), contains no pesticides, and safe for daily use. Lice Slayers Shampoo is the first of its kind for a natural shampoo that is good for your hair and scalp, and also part of an effective home lice treatment. Lice Slayers Shampoo is made with the highest quality of natural products and essential oils. The result is a sulfate free shampoo with conditioning properties that is great for daily use and lice treatment. Lice Slayers Shampoo is made from the highest quality natural products & essential oils. Lice Slayers Shampoo contains neem oil is a natural insect repellent from the Neem Tree, also known as the village pharmacy tree, and peppermint oil to help defend from future lice infestations. The result is a sulfate-free shampoo that is great for daily use and is perfect for children & adults who have a sensitive scalp. When used daily, Lice Slayers Shampoo can help defend your hair from lice infestation by washing out any lice before they have a chance to multiply and spread. Lice Slayers Shampoo invigorates scalp circulation and gently cleanses. Lice Slayers Shampoo is great to use when trying to prevent a future lice infestation. Using the Lice Slayers Shampoo, Lice Slayers Conditioner, and Nit Free Terminator Comb are a very effective combination for the deterrence of head lice. Lice Slayers Conditioner is non-toxic, sulfate free, made with essential oils, fights lice and their eggs, contains no pesticides, and safe for daily use. 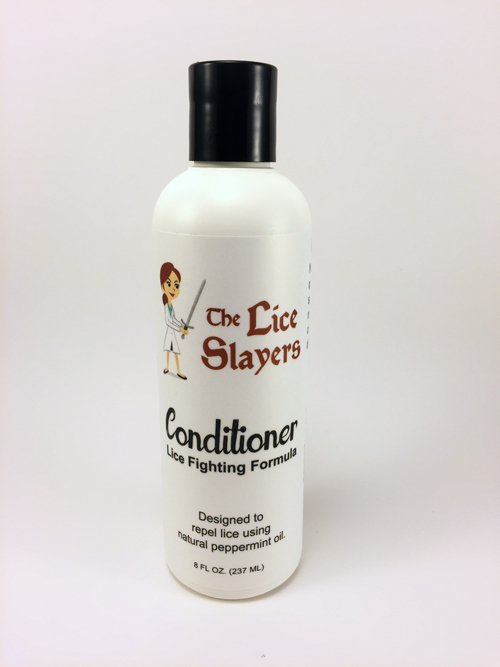 Lice Slayers Conditioner, when used in conjunction with our Lice Slayers Shampoo and Nit Free Terminator Comb, can help defend your hair from a lice infestation by repelling lice and their friends. Lice Slayers Conditioner is all natural and made from essential oils that lice find offensive. High quality ingredients detangle the hair and leave a smooth and shiny luster. It is the perfect product to use before combing with the Nit Free Terminator Comb. Lice Slayers Conditioner Ingredients: Aqua, Glycerin, Stearalkonium Chloride, Cetyl Alcohol, Caprylic/Capric Triglyceride, Glyceryl Stearate, Frangrance, Mentha Viridis (Spearamint) Leaf Oil, Phenonyethanol, Caprylyl Glycol, Lanolin, Azadirachta Indica (Neem) Oil, Eucalyptus Globulus Leaf Oil, Malaleuca Alternifolia (Tea Tree) Oil, Pongamia Glabra (Karanja) Oil, Tocopherol, Daucus Carota Sativ (Carrot) Root Extract, Glycine Soja (Soybean) Oil, Beta-Carotene, Disodium EDTA, Citric Acid, Rosamarinus Officinalis ( Rosemary) Extract. Lice Slayers Conditioner is for external use only. Avoid getting into eyes. It is important to keep Lice Slayers Conditioner out of the eyes to prevent eye irritation. If there is accidental eye contact, flush eye thoroughly with cool water. In case of accidental ingestion, seek professional medical assistance. Lice Slayers Conditioner contains no pesticides. Please keep this product, and others like it, out of the reach of children. Lice Slayers Mint Spray is the first of its kind used as a lice fighting tool. 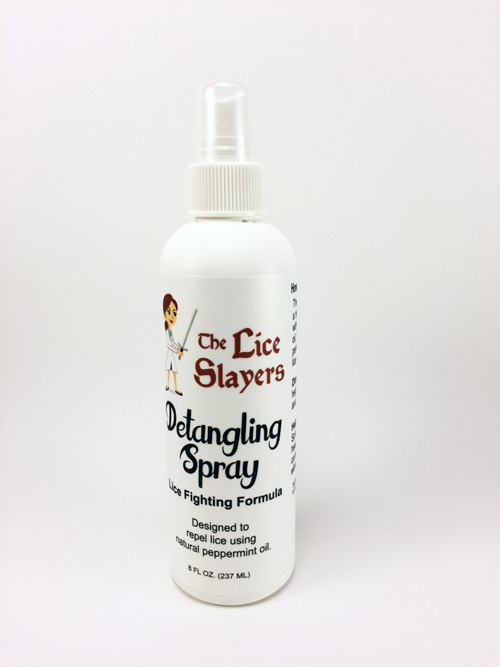 This spray is a specialized mint formula that wards off head lice. Lice find the smell of Lice Slayers Mint Spray offensive and will not attach to the hair. Lice Slayers Mint Spray may be used as often as necessary to help anyone who is treating head lice. 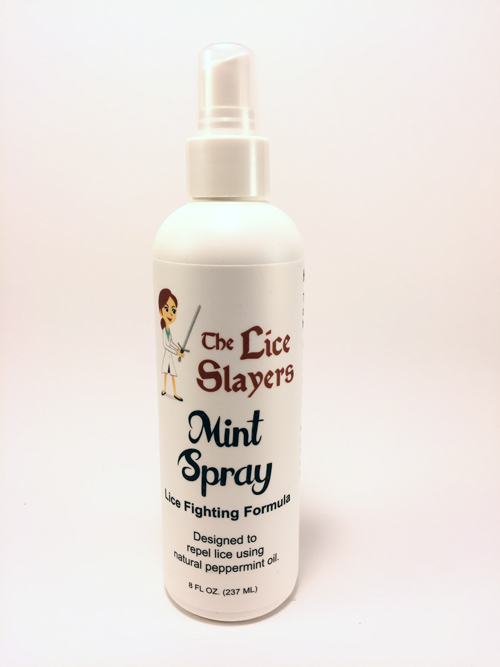 Whether you’ve been affected once or multiple times with lice, Lice Slayers Mint Spray has been formulated to help keep the lice away. Lightly mist Lice Slayers Mint Spray on hair, with special attention given to the nape of the neck and behind the ears. Spray may be used once per day or several times per day. 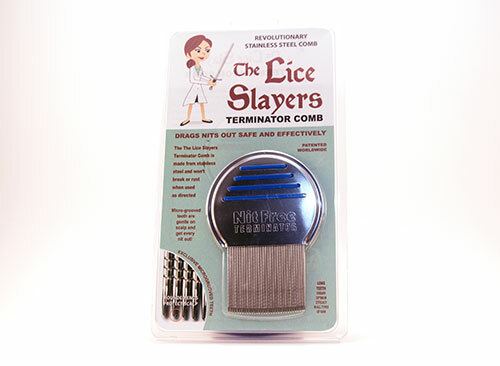 To completely remove head lice from the hair, the Nit Free Terminator Comb is highly recommended. 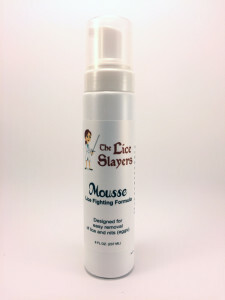 Lice Slayers Mousse is a 2-in-1 enzyme treatment. Lice Slayers Mousse is intended to be used mainly to dissolve the glue that holds the egg (nit) to the hair shaft. This allows the egg (nit) to be easily combed out with the Nit Free Terminator Comb. Our Nit Free products are safe, natural, and non-toxic. Even though you can leave Lice Slayers Mousse in your child’s hair for extended periods of time, we do not recommend it. The natural ingredients may cause irritation if it gets into the eyes, so be careful when using around the face and watch for product running down the face when rinsing. 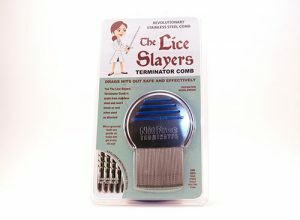 Lice Slayers Mouse will work effectively in as little as 15 minutes. Place a clean washcloth or other suitable material over eyes for protection. Moisten hair with warm water. The Lice Slayers Spray advanced foam applicator makes application easy. Apply an ample amount of Lice Slayers Mousse to cover and saturate moist hair and scalp, root to end. Massage lightly to keep foam in hair. Leave on hair at least 5 minutes and do not rinse. Add a second application of Lice Slayers Mousse to hair and scalp. Leave product on the hair and scalp for an additional 5 minutes. While Lice Slayers Mousse is still in hair, we highly recommend using the Nit Free Terminator Comb to comb through hair root to end. Lice Slayers Conditioner may be added to assist with combing long or thick hair. Eggs are easily removed when each section of hair is combed from the scalp to the end of hair. Comb each section four ways (top, bottom, left, and right) to ensure all eggs are removed. Rinse product out of hair with a strong spray of warm water, being careful to avoid getting in eyes. Use a bright light and the Nit Free Terminator Comb to thoroughly inspect hair and scalp. Pay close attention to the areas behind the ears and nape of neck. If stubborn lice or nits remain immediately re-treat with Lice Slayers Mousse using steps above. After removing lice and their nits, use Lice Slayers Mint Spray to repel lice from the hair. Lice Slayers Mousse is for external use only. Avoid getting into eyes. It is important to keep this cleanser out of the eyes to prevent eye irritation. If there is accidental eye contact, flush eye throughly with cool water. In case of accidental ingestion seek professional medical assistance. Lice Slayers Mousse is pesticide free, safe for repeated applications, and clinically proven to dissolve nit glue. Ingredients: Naturally occurring, non-bacterial, readily biodegradable, enzymatic solution derived from safe yeast strains, water (aqua), mild non-ionic surfactant blend. FDA: Generally Regarded As Safe or Food Grade (GRAS) List, Parts 184 and 186. Use responsibly as directed. 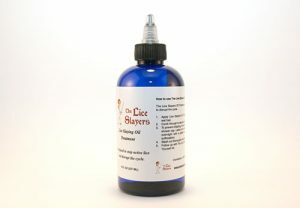 Lice Slayers Oil Treatment is designed to suffocate and stops active lice in their tracks and disrupt the cycle. Lice Slayers Oil Treatment is Non-Toxic and pesticide free. Our Oil Treatment is the natural way to rid your family of head lice and is safe for repeated use. It can also be used as a preventative measure. Can be sterilized for repeated use.